Tile color and type of cut: Each custom mural is a custom-designed work of art. 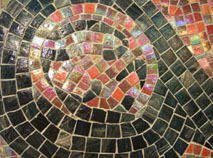 The mosaicists have an unlimited palette of mosaic colors and tile types to choose from, including Venetian glass, Smalti, gold leaf and stone. This limitless selection of materials, in combination with excellent mosaic craftsmanship, allows for stunning simulations of the various textures, colors and detailed shadings in the original artwork. If you are working with specific design ideas or budgets, you may select your desired type of tile and type of cut (see examples of cut types at right). 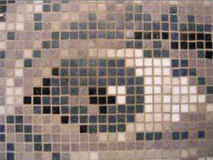 Or you may give our experienced team of designers "artistic license" to create your custom mosaic masterpiece. The possibilities are virtually limitless. Dimensions: There are no absolute minimum or maximum dimensions for custom murals. Remember that smaller murals will require a finer cut to achieve the same detail as a larger mural with a rough cut. Design drawings: After receiving design specifications, a drawing of your custom mural design will be emailed for your final approval. Mounting: Custom murals are available mesh-back mounted or paper-face mounted. (Mesh-backed mounted murals are also mounted with clear film on the face of the tile for extra protection during shipping and installation.) We recommend paper-face mounting for floor and pool applications to ensure the strongest bond between the backside of the tile and the setting material. Note: Paper-face mounted murals MUST be installed paper side UP. Packing: Cut murals up to 6.5’ x 13’ are shipped as a single unit and rolled up, like a carpet. Murals larger than this are cut into smaller sections at the factory and then rejoined at time of installation. Each section is labeled and a positioning guideline is included. Uncut murals are prepared on standard 1.15 sq. ft. sheets and packaged in standard cartons and labeled with instructions for proper positioning. Installation: Murals can be installed directly onto a wall substrate...or can first be installed on a horizontally positioned backer board (or other approved substrate), which is then lifted and attached to the vertical wall surface. To achieve desired results, it is highly recommended that skilled tile tradesmen be used for all mural installations. Suitable applications: Suitable for any interior or exterior application where ceramic, glass, or porcelain tile may be used. Fine-cut murals are most suited for wall applications. 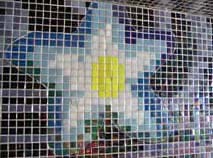 We do not recommend cut glass murals for high traffic floors or barefoot areas. Pricing: Each custom mural is individually quoted based on the material, dimensions, fineness of cut, and complexity. Lead time: Upon receiving your final design approval and 50% deposit, lead time is approximately 8 to 12 weeks. This lead time estimate assumes ocean shipment from our factory. This is a general lead time for a typical mural. Large, fine-cut murals may require additional time. Air freight is also available. Balance due: The remaining balance of your custom mural order, including shipping, will be due when the order is ready to ship. If paying by check, we must receive the check prior to shipping. 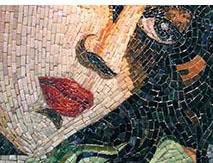 For more information about our mosaic murals, or to place an order, please email info@hakatai.com or call 888-667-2429.